In the last post, I explained how I organize my gear for a basic DSLR video shoot. But once you've recorded all the audio and footage you need for your project, you'll need to take it all back to your home or office and upload all that data onto your computer. If you're anything like me, you're usually going to return with a ton of audio, video and image assets, and they're all going to need to be accessible if you hope to be successful in editing. One thing that has always surprised me about my friends and colleagues in the media production business is the number of people who have absolutely no system or logic behind organizing their data. Most people I know, and literally all of my interns and assistants over the years, have absolutely no consistency at all when setting up projects. The consequence of this lack of organization is that projects are hard to find in folders, data within those folders is an unmanageable mess, and if a file ever gets disconnected (intentionally or unintentionally) in programs like Premiere, Final Cut, Illustrator, Audition, Cubase, etc., good luck finding it again! Besides... Let's be honest, it's just ugly. Bad organization makes everything you want to do ten times harder, and take ten times longer than you need it to. Alternatively, a good project organization system certainly doesn't have to look exactly like mine, but it should help keep track of everything you need to produce high quality media as efficiently as possible. This is actually going to take several layers of organization... Starting with the main project folders themselves. I've redacted client names for what I hope are obvious reasons, but I as you can see, my folder system is labeled first by date by year, then month, then day; then by client, then the specific project. If you work on as many projects in a year as I do, you'll find that this dating system is by far the most effective for keeping everything ordered chronologically. Since I often have a bunch of different clients (in addition to starting a bunch of my own projects), it's helpful to put your client name next. This system lets me keep track of all my projects throughout the year, and it's extremely easy for me to refer to older projects whenever I need to. You might also notice the 0000-Templates & Standard Elements folder. I find that creating project templates for recurring types of productions is one of the best ways possible to save time in project set up. More on that in a second. Let's get into how I organize within each of my individual project folders. 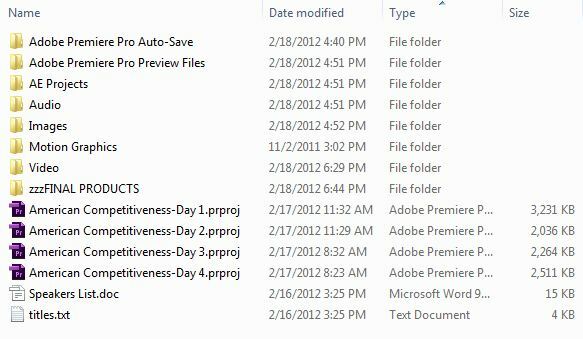 As you can see above, this is an actual project folder from a 4-day event videography gig I did for GE a while back. Some people like to put all of their assets into a single folder. I don't. Note also that while I keep my assets in sub-folders, I have my project files (.pproj in the case of Premiere, and .npr in the case of Nuendo), and often my final outputs, in the main folder. But that's not where the file organization ends. Anybody who started working in video before the digital revolution can probably remember the years (decades) of logging and capturing, beta or mini-DV tapes, and on-paper record keeping. Logging clips by hand was essential if you ever wanted to present a clear set of notes to an editor, or to the assistant editors who are generally responsible for tracking down the right tape or reel and cutting the appropriate clips. It was, let me tell you, awful. And I was only ever working with Betas and mini-DV tapes! Film reels were (and are) so much worse. But since the advancement of digital technology, all that's changed. Now we live in a luxurious time where instead of capturing video footage in real-time, and then capturing it all over again when the first attempt dropped frames and failed half-way through the process, we can simply copy digital files from the memory card right to our hard drives. It's basically a miracle of technology. Even so, your files usually still need to be appropriately labeled so that the editing process can function smoothly. You'll note that I label them first by their relevant type, then by number, then with the name of the interview subject on camera. Essentially, I'm putting the same information you'd find on a properly slated video clip. One additional word of advice on this kind of labeling - do it as you import your clips. Don't wait several days and then come back to do your labeling, or you'll forget all the important details. There's nothing worse than having to go back and log clips when you don't quite remember what they contain. At any rate, taking the time to do all of this organization is extremely useful - although, I do make a few exceptions at this final stage. If I'm working on a smaller project - one without too many clips, multiple parts, or numerous scenes and takes corresponding to a script - I will often forego this last stage of file organization for the sake of speed. For example, when I was still regularly producing my weekly web-series, "The Libertarienne Show", I would often simply leave my individual video assets unlabeled. The truth is, in these cases, it takes more time for me to individually label each file than it does to simply work through the footage in Premiere while editing. Use your best judgement when you get to this level of detail. The goal is to save yourself time, effort, and confusion - and to enable you to archive projects or transfer projects in a way that lets you or anyone else easily revisit them later and know exactly what and where everything is. Organization really is the key to being a successful producer. Now... I have one last thing to talk about. Templates. As I pointed out above, I use a folder template so that instead of typing out "Audio", "AE Projects", "Images", "Motion Graphics", and "Video" every single time I set-up a new project, I can simply copy and paste all the empty folders. But that's hardly the greatest value produced by establishing project templates. Any time you have a recurring project that requires the use of the same branding, chyrons, motion graphic bumpers, and other audio or video assets over and over, you should set up a project folder with all of those required assets already housed in the appropriate sub-folders, along with a project file in your work software (ie. Premiere, Final Cut, Avid, Cubase, Nuendo, Digital Performer, etc.) that has all the repeated work already done for you. That means, when you copy the template, all you have to do is rename the project file. But when you open that file up, everything you know you're going to need - from watermarks and intros to sound effects and music - is already right there waiting for you. It would be impossible for me to even calculate how much time and effort this simple technique has saved me over the years. So now you know my system. I've found it to be quite effective over the last several years. You may find it enhances your productivity as well. And as always with this blog, e-mail me at citizena.media@gmail.com with any and all media production questions, and I'll try to get back to you with an answer! As I noted in my first post on getting organized, there are tons of crucial benefits to being well-organized when it comes to producing any kind of media. But strangely, that's one skill typically left out of everyone's formal training on how to get good at film-making and media creation. Digital Single-Lens Reflex - or DSLR - film-making has exploded in the last few years, and it has some amazing benefits. Apart from producing high quality, high-resolution images at a fraction of the cost of other professional video recording devices, they're also exceptionally portable. That's why it's become such a popular option for film-makers around the world, and especially for those of us working on a budget. However, to get the best out of your DSLR videography, the camera itself just isn't enough. You'll need audio recording hardware, cables, lights, memory cards, spare batteries and a means to stabilize the camera itself. And as anyone who's been filming on sets or on location knows, you're also going to need a bunch of adapters and other gear just to be prepared for all the unexpected things that can - and always do - happen when you're out on a gig. I've been there, and done that... And over time - and many mistakes - I've put together a portable, effective kit filled with most of the gear I need to get almost any job done. Although that looks like - and is - a ton of stuff, it all fits nicely into a single bag... At least, all of it except the actual shoulder-rig, which can actually be easily broken down and stored in a back-pack if you're traveling through an airport or going on a longer trek to your location. The point is to make sure that you are prepared for any eventuality that might arise while you're out capturing the footage you need, while systemizing your gear so that everything has a place that's easily accessible when you need it.. Having your kit organized simplifies your life, and makes it so that you can grab the bag and run out the door at a moment's notice when you need to. Plus, when you're not using it, all of your stuff is stored neatly and cleanly away right where you left it. Now... I know I'm going to get some questions about why I included what I included here, so I want to walk through some of the reasons I've chosen certain things to put in this case over others. We'll be talking about other camera options in the future, but as I said above, DSLR's are affordable and they're really great for a ton of environments. They're light, they're small, they accept all shapes and sizes of high quality lenses, and their imaging sensors are unbeatable for the price... which is typically very inexpensive compared to other professional gear. Problem is... Their audio capabilities are usually horrible, they suffer from severe rolling-shutter problems (which means they usually will need to be externally stabilized), their record-time is highly limited (which is a serious problem for many video production requirements), and in nearly all cases they just can't compete with more professional options in extreme low or high light situations. Fortunately, there are solutions to (most of) these problems! The biggest problem with DSLR cameras is that their built-in microphones are just about useless, and the features they offer for connecting external microphones are minimal at best - typically only a 1/8" stereo input, like the kind of connection you see on a pair of headphones. We can correct for this problem by purchasing a separate sound recording device that either has higher-quality built-in microphones, or which accept XLR microphone and line inputs. I prefer the TASCAM DR-100 (approx. $330), but many of my colleagues like the H4N Zoom, and some people I know use a JuicedLink box, connected below their cameras. I prefer the TASCAM because it produces a generally superior quality recording, it has a lot more features, it has better built-in microphones, and it can be more easily converted for use as a small 2-channel field mixer if you have the luxury of a separate production sound mixer/boom operator. But all are decent options. As you can see in the image above, I keep two DR-100 field recorders on hand, because good audio is a must and having a back-up (that can also be used as a battery charger) is smart - I've learned from painful experience on that one. Of course... Along with a separate sound reording device, you'll need microphones, cables and other hardware to attach the recorder to your rig. Typically, video production sound is captured one of two ways - either with a condenser "shotgun" microphone held on a boom pole, or with lavalier microphones clipped to the subject's clothing. Sidenote: In Electronic News Gathering (ENG) videography, sometimes reporters will hold a super-cardiod microphone while getting interviews from people on the street - but I will cover that in later posts on understanding differences in microphones. In my kit, I usually keep a single shotgun microphone (I travel most with a fairly inexpensive one from Audio Technica), and a pair of wired lavalier mics. I also travel with a wireless XLR transmitter and receiver, in case I need to leave a microphone on or near a subject and still be mobile with the camera. The drawback here is that you're relying on a radio signal to get you the audio you need, and the battery life on wireless gear is notoriously limited. I also never leave home without an assortment of audio adapters and several XLR cables. Since I spent most of my earlier career working in the music industry and performing live myself as a drummer and vibraphonist (and classical percussionist), I've built up a great little kit (on right). It includes different adapters for XLR, RCA, 1/4" mono/stereo, 1/8" stereo mini-plug, and other types of connections. I also keep a spare size "N" battery or two in the kit, for when I need to swap out batteries in my powered shotgun microphones. Turns out, you can also buy a pre-made audio survival kit from Film Tools for under $100, and I would definitely recommend it. Especially if you find that you're trying to film different events and get audio from different sources, these adapters can be a life-saver. ...and don't forget the headphones! I usually carry two lenses with me at minimum - both zoom lenses, for maximum versatility. One is typically a wider lens that doesn't have a huge magnification range. For this, I find Canon's 17-55mm f/2.8 IS lens is a great choice for DSLR film-making. My other lens is typically a much longer option, for those moments when you need to grab a close-up or capture footage from greater distances. For instance, I also have a less expensive, but still good, Tamron 18-270mm f/3.5-6.5 VC zoom lens, and carry that almost all the time. Between these two lenses, I can capture a pretty wide range of photography & videography environments. Again... This is designed for versatility and to be prepared for unknown situations, not for any specific creative shot choices - nor am I suggesting that the lenses I carry are always "the best" possible. If you know the shots you're going to need to get, other lenses may be far more appropriate. We'll talk more about lenses later on. This one is a bit trickier, because a professional lighting set-up - which I will definitely cover in future posts - is one of those things that simply takes up a ton of space and will never be able to fit in this little kit bag. Fortunately, in most amateur and on-the-fly settings, a simple LED video light attached to your camera or held by an assistant works just fine. Plus they're really inexpensive (less than $50 in some cases!) and easy to find on eBay by searching for "LED video light". Apart from the basics (including all necessary chargers, adapters and batteries, etc. ), I strongly encourage everyone to carry a few other absolutely essential items if you want to be prepared. A multi-tool with at least pliers, knife/scissors, can-opener & phillips/flat-head screwdriver attachments. But don't forget that the TSA bans knives and other exceptionally useful multi-tools, so be sure to move that into your checked luggage if you're traveling long-distances. Believe me, they've got no problems confiscating $50+ Leatherman tools. Apart from the kit itself, unless you're a professional, you absolutely do not need a shoulder rig or stabilization system as fancy as mine. When I started with DSLRs, I frequently just used a simple monopod, and connected my audio recorder to the camera's hot-shoe with an adapter. I did this even while working for a news website getting interviews in front of the White House, and most people would never know the difference. Eventually, I'll do another post about stabilization, about my rig, and what your other options might be - but right now, I just wanted to show you all the basic organizational system, packing & set-up I use on a day-to-day basis. Why a tool-bag instead of a camera bag? First, tool-bags like the one you see above (made by Husky) are incredibly rugged, well-made and are designed to carry heavy loads. In addition, the good ones store lots of stuff and they have a ton of pockets, dividers, and work exceptionally well for this kind of all-encompassing video-production kit. Second, camera bags tend to be ridiculously - and unreasonably, in my opinion - expensive. For example, Portabrace (one of the leading manufacturers of professional cases for the film industry) makes an 18.5"x12"x9" camera case which is comparable in size to my Husky tool bag. It is softer, has a fraction of the internal pockets, no dividers, and isn't as rigid. It costs $419.00 - $469.00. My bag: $40. I'll leave you to do the math for yourself. I hope this post helps you get a better sense of the gear you'll need to go out with your DSLR and shoot your own videos. Just remember: Organization really will set you free. The better you are at keeping track of everything and being prepared for all kinds of recording environments, the more you can just concentrate on the business of actually creating your videos... And that's what it's all about! As always with this blog, e-mail me at citizena.media@gmail.com with any and all media production questions, and I'll try to get back to you with an answer! How To Get Organized: Why? Before I get to anything super technical about how to work with the hardware and software you'll need to master in order to get really good at media production, I want to take a minute and talk about getting organized . "Organization will set you free." Getting organized will save you time, it will save you hassle, it will save you money, and it will increase your productivity in ways you cannot even imagine. I'm often asked how I'm able to produce so much content and work as quickly and effectively as I do... and the answer is all about organization. Every system I have for managing my equipment and my projects serves the single purpose of making my life easier. I know where everything is, I have easy-to-remember and easy-to-use naming conventions, I build project templates when working on recurring products, and I will frequently take a little time up-front to do certain types of work that will save me tons of time later on down the road. All of these things are designed to enable me to spend as much of my time as possible making creative decisions about how to write, shoot & edit, and as little time as possible figuring out the structure and logistics of what I'm about to do. Every media production job is messy, unpredictable, and stressful enough as it is... Adding to that chaos by being disorganized is a recipe for disaster, and the best way I know of to force yourself into making tons of stupid mistakes, producing a poorer quality product, and taking far longer than you'd ever want to spend trying to fix everything you could have gotten right in the first place. 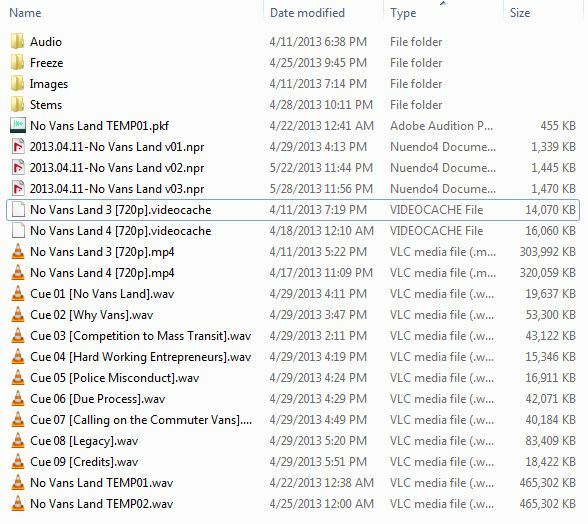 With this set of tutorials, I'm going to show you how I organize my gear & how I pack one of my travel bags; how I organize my project folders, the files within those folders, and the various clips and layers within various media production projects; and I'm going to show you how to save precious time by creating re-usable templates for your videos. But most importantly, what I hope to accomplish here, is to get you to think about how you organize your process, so that you can work more professionally and consistently.